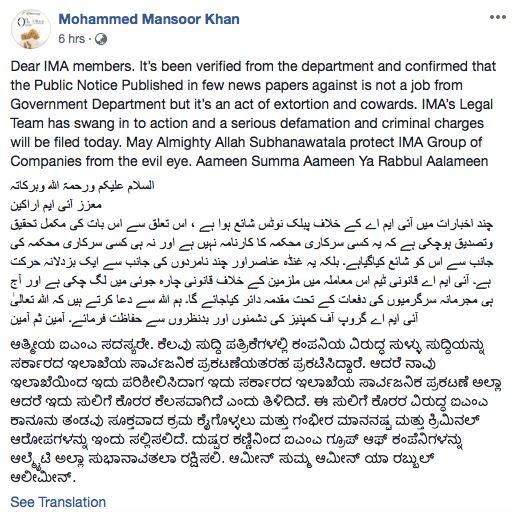 Bengaluru: Calling its activities as “illegal”, the Office of the Assistant Commissioner on Tuesday issued a forfeiture notice against Bengaluru-based financial Company, I Monetary Advisory (IMA). In its notice, CASE No: MSC.CR:07/18-19, which appeared in The Times of India newspaper, the Assistant Commissioner’s office has alleged that IMA is collecting money from the public and “diverting” the funds to its directors’ “self-interest”. “I Monetary Advisory Private Limited and its associates have committed an offence by illegally collecting the money from the public & diverting the said funds to its Directors self interest thereby committed default in repayment of the depositors’ money (sic),” the notice states. 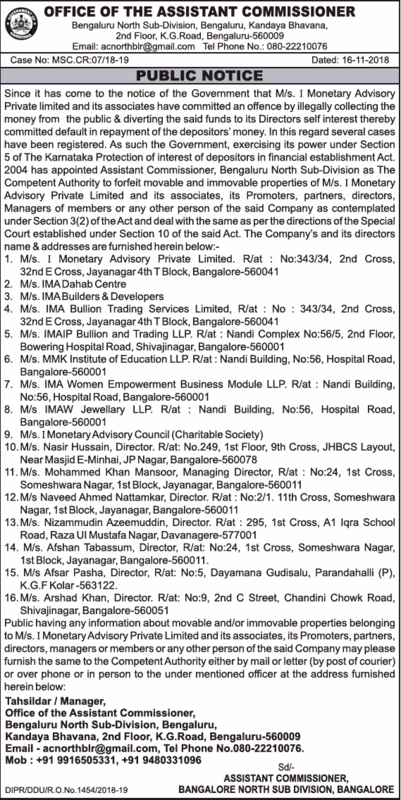 The notice further states that the Office of the Assistant Commissioner of Bengaluru North Sub-Division has been appointed as the Competent Authority under Section 5 of the Karnataka Protection of Interest of Depositors in Financial Establishments Act, 2004, to forfeit movable and immovable properties of I Monetary Advisory (IMA), and its associates, promoters, partners and directors. The news of the forfeiture notice issued against the company soon created panic among investors, and the screenshots of the newspaper cut out was circulated like wildfire on social media and WhatsApp groups. N Ravindra, the manager at the Office of the Assistant Commissioner confirmed to The Cognate that the notice was indeed issued by his office, and brushed aside the allegations made by IMA’s CEO. “We issued the notice to the company after we received an order from the Corps of Detectives (CoD),” he claimed. The Cognate tried to contact Mansoor Khan for his response, but despite our repeated attempts we were unable to reach him. 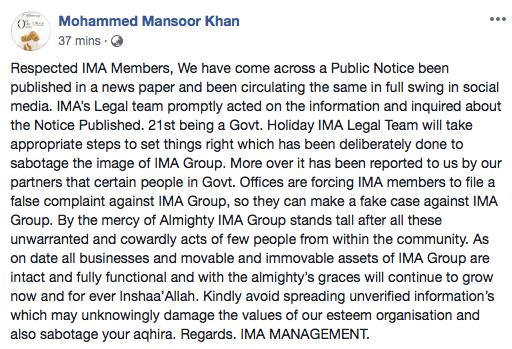 However, in a statement issued a few hours after his first statement, Mansoor Khan has alleged that certain officers in the government are “forcing IMA members to file a false complaint against IMA Group, so they can make a fake case against IMA Group.” As on date all businesses and movable and immovable assets of IMA Group are intact and fully functional and with the almighty’s graces will continue to grow now and for ever Inshaa’Allah (sic),” he has stated. Bengaluru-based I Monetary Advisory (IMA) is a bullion trading company, which was started by Mohammed Mansoor Khan in 2006. According to its website, the group operates a wide range of businesses including, a credit co-operative & housing society, health care services, a multispecialty hospital, hypermarkets & supermarkets, infrastructure & real estate development, printing & publishing and retail sales of gold, silver, diamond & platinum jewellery. This is a developing story, The Cognate will try to cover all the updates.